This year we are, in total contrast to last year’s Royal Wedding, all geared up and raring to go with new Rye Pottery designs to commemorate the Queen’s Diamond Jubilee. We have planned and painted a sample of our hand-painted large plate, as well as designing the artwork for the much-loved little transfer tankards and small dishes. We hope to add some one-off pots throughout the next 6 months, which will be sold on a strictly first come first served basis. 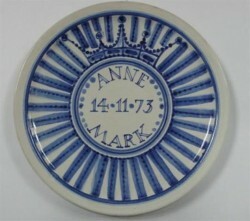 Rye Pottery have produced Royal Commemoratives for over 100 years. Hastings Museum has a 1902 jug made for Edward VII and we’ve also seen trials and drawings for an Edward VIII 1936 mug designed by Robert “Bobby” Baker (later Professor of Ceramics at the Royal College of Art while Tarquin was a student) who before WW2 was working for Rural Industries. The post-war Cole dynasty at Rye Pottery made tankards and dishes for the 1953 Coronation and have never looked back, producing special designs for each succeeding Royal event. We even printed 2 miles of 6 inch square tiles during the 1981 Royal Wedding celebrations. 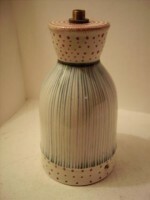 Recently we bought two lovely Royal pieces on ebay, one of which, a Wally Cole design, is we believe a one-off. Last week we were saddened but interested to see an obituary of cartoonist Ronald Searle that used a photograph of him standing in his studio. Just behind him was a lovely 50s Rye Pottery Jug holding his paint brushes. (You can see the picture here). Spotting the Rye Pot is always a fun game – they seem to come up in Midsomer Murders frequently, though so far no piece has been the actual murder weapon! Last week was also the anniversary of the death of Edward the Confessor in 1066 and the accession to the English throne of Harold the following day; so much for his promises to William, perhaps like many politicians the opportunity of holding power made it worthwhile jettisoning his principles. For the next 9 weeks the railway from Ashford to Hastings via Rye will be closed for major repairs, so if you are visiting Rye it will be simpler to travel by car until the end of March. A new year and some old friends. The Christmas decorations are now all put away until next December, while we work our way through some large boxes of samples that had been stored away when we were moving out of the Ferry Road site 5 years ago this month. We have found several figures in different colourways, some of which we may decide to repeat, as well as some very early lamp bases with charming hand painted designs which we may copy onto some other shapes. Meanwhile we wish all our collectors a very happy and healthy 2012 and we look forward to hearing from you and hopefully seeing some of you during the coming year.